Thank you to everyone who helped me destash a little! I lowered some of the prices later today. I was asked by Laura (Maude and Mozart) if I was giving up stitching, and that is a big No! I could never give up my stitching. I really want to get back to Charlotte Clayton and get it finished up soon (I'm sounding like a broken record)! I just needed to purge a little. Now that I'm working full time, it's definitely harder to pick up the stitching. Knitting and crochet has been easy. It's especially great to take it to work. I keep it in the file drawer in my desk and I can throw it down quickly if I need to answer the phone or help someone out. There are periods when it's super busy and then there are times when it's very slow and my needlework keeps me from getting too bored and keeps me sane. :) I'm really lucky I found the job I did. My co-workers very quickly became my friends and I have met some really great people. There are many days they have my laughing until I'm crying! Anyway, It's been great! So, I haven't stitched in awhile, but I have been knitting. Currently, I'm working on the Pendulum Shawl by Amy Miller. 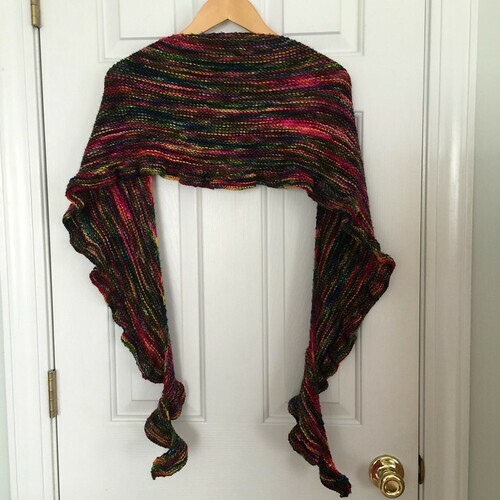 I copied the first shawl in the picture on the project page by DragonInk. I'm using the same yarn she used, which is Madelinetosh Tosh Merino Light in the same colors she used - Goddess, which looks black, but is actually a very dark purple and Calligraphy. I'm fairly happy with how it's turning out. My short row turns are a little wonky, but I'm hoping it won't show as much once it's washed and blocked. I am also getting a little tired of garter stitch. I just finished a garter stitch shawl recently. 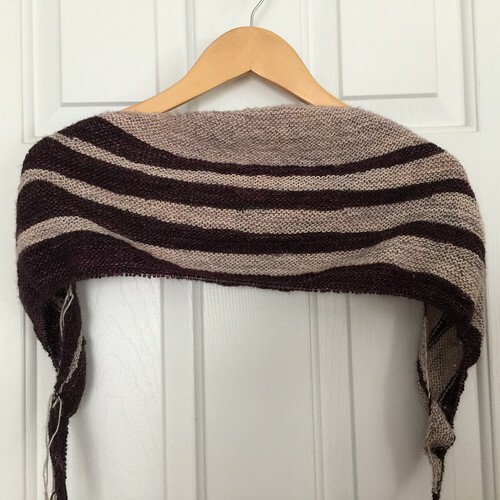 The Yowza Weigh It Shawl #1 by Susan B. Anderson. I love this shawl. It's so warm and squishy. I can't wait to wear it this fall/winter. This yarn is Miss Babs Yowza in the Perfectly Wreckless colorway. 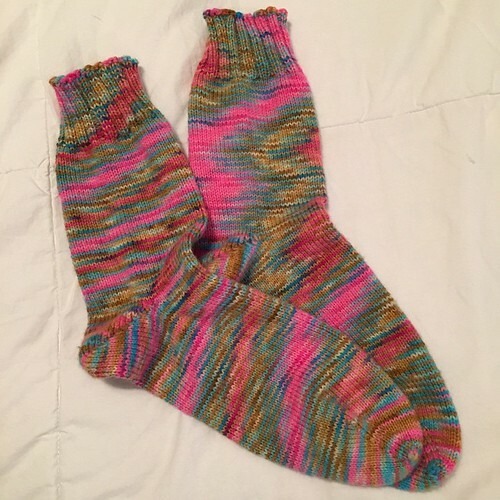 I also finished two pairs of socks. I have discovered that I now love toe up socks and magic loop. Two things I thought I'd never do! 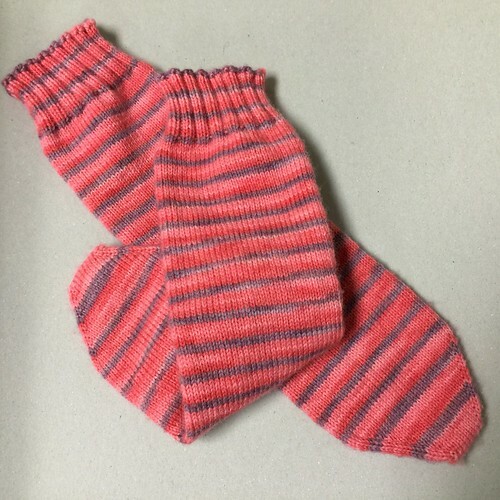 I knit these socks in five days! They were a blast. I love how funky they turned out. They're so soft and warm too. I did the Fish Lips Kiss Heel for this pair. I like this heel, but I may need a little more practice. The second pair are my Kool-Aid socks. I decided I was going to dye some bare yarn I've had in my stash for years. I used grape, pink lemonade and cherry. I have dyed yarn before and I don't remember it being so difficult. I lost about 100 yards in the process. It got so tangled that I just tossed it. I still had enough to make a decent size pair of socks. These socks took even less time - four days! Love that magic loop! I do hope to keep up with the blog though. It feels good to be writing again! Nice to see you back, I've missed you. Nicole, how do you go about listing your items for destash? I have alot of patterns/books that I'd like to sell, but don't whether I should list them on ebay or my blog. I love seeing all of your beautiful knitting projects. Nicole your knitting is to die for.I would love to make the socks. I would love to do some toe up and have circular needles. I just need to watch a good tutorial. ?